A good permanent dumpster service is necessary to keep your organization running efficiently, but your bins are better off hidden from your customers. Not to mention the people who see them as their own personal dumping ground. They’re also the best way to keep wildlife like raccoons or coyotes from getting into your trash. A commercial dumpster enclosure will keep your property looking spiffy and prevent passersby from overloading your bins— which can rack up extra fees for you in the process. And good news: building a dumpster corral isn’t difficult. We’re here to show you how. Dumpster fences can be made out of several different materials. The chart below shows some pros and cons of each to help you choose. Pro-Tip: Some cities require dumpster fences be made out of a specific material. Check the regulations in your area by searching your local Building Department’s website or giving them a call. The dimensions of your dumpster enclosure need to account not only for the size of the dumpster itself but leave enough room for employees to use your bin and for a garbage truck to pick it up. Dumpster corrals can be built with a variety of dimensions, but use the table below as a general starting point. Pro-Tip: Some cities require their own dimensions for dumpster enclosures. Check with your local Building Department to find out if any rules apply in your area. It’s tempting to try to save some money by putting up your enclosure yourself, but it may end up costing more in the long run if you make mistakes. Some types of dumpster corrals are better candidates for DIY installation than others. Since you’ll likely be building your dumpster enclosure on a parking lot or other concrete surface, keep in mind that you if you choose DIY installation you’ll need to rent a hammer drill to create post holes. Whatever surface you’re building your fence on, you’ll need to mix and pour concrete to make the posts sturdy. If you’re not up for either of those tasks, choose pro installation no matter what type of corral you’re building. It’s much more cost-effective to get it done right upfront than to build a flimsy fence that can’t stand up to repeated use. If you’ve decided to DIY your dumpster enclosure installation, read on for our handy instructions. Use a string line to mark the perimeter of your fence. Determine where the posts will go. Mark where the center of each post will sit. Measure the width of your fence posts. Multiply that number by 3. This gives you the diameter needed for your post holes. Draw a circle with the proper diameter around each of the center-post marks. Drill holes about one inch apart around the perimeter of each circle using a hammer drill. Then drill several holes within the circle. This will prevent spider web cracks from forming in the surrounding concrete during the next step. Switch to a chisel drill bit. This turns your hammer drill into a small-scale jackhammer to begin breaking up the concrete within the circle. Once all the concrete has been broken up and removed, use a post hole digger to create a hole 24 inches deep. Add a few inches of gravel to the hole for drainage. Repeat steps 6-8 for each post. Important Safety Tip: Always call Digline at 8-1-1 before any digging project to make sure you’re not in danger of hitting utility lines. This protects you from potential injury and extremely costly damages. Place posts in their holes. Brace them upright with 2 x 4s. Use a string line to ensure they all sit at the same height and are level. Mix quick-set concrete in a bucket following the instructions on the package. Double check that your posts are level and at the right height. Pour concrete to the top of each hole. Be careful not to let a dip form around the post. From here on out, simply assemble your wood or vinyl dumpster corral according to the manufacturer’s instructions. 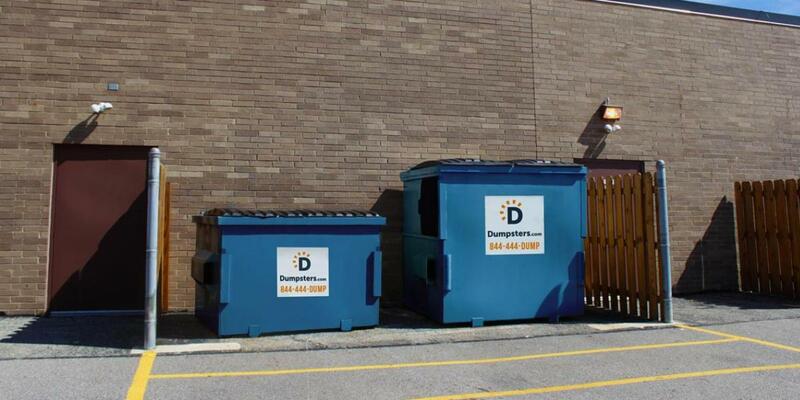 Once you’ve installed a commercial dumpster enclosure, you can take out the trash without it being an eye-sore for your customers--or finding other people’s rubbish hitching a ride with the garbage service you pay for. If you have more questions about sizing or placement for your dumpster corral, give our team a call at 844-444-3867. We’re here to help. Want to make fewer trips to the dumpster each week? 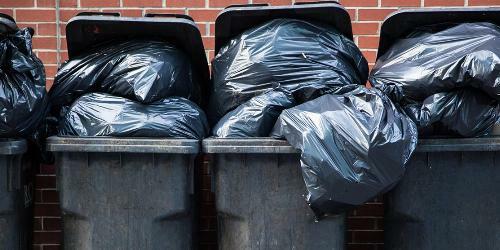 Learn how to conduct a waste for your business, and you might just end up lowering your garbage bill. A biohazard waste plan is essential for a safe workplace. Find out how to properly dispose of infectious materials like sharps, contaminated laundry and bodily fluids. 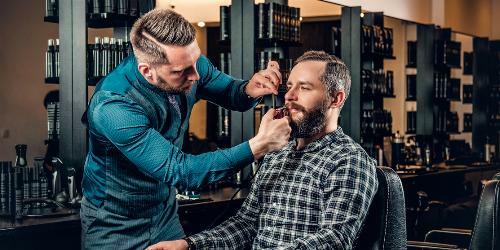 If you want to set sustainability goals for your business, it’s time to learn how to manage waste in a greener way.